3 Bedroom Detached House For Sale in Chislehurst for Asking Price £725,000. The home, "48 Lower Camden" Chislehurst, is a three bedroomed older detached house, with no forward chain. It is situated on a street of charming and architecturally diverse properties. 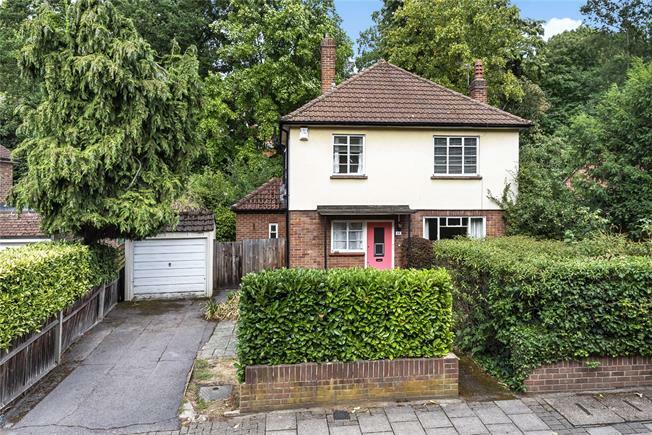 Conveniently placed between two stations, Chislehurst 0.4 miles and Elmstead Woods 0.6 miles, with no steep inclines, and a fast commute to London. The house is on the other side of the road to the railway track. The home offers a small entrance hall, with stairs leading to the first floor. A lounge with views to the front and back gardens, a small kitchen and adjoining "dinette". A downstairs bathroom was modified for the last owner to a wet room. On the first floor there is a comfortably sized master bedroom and two smaller bedrooms. A family bathroom, with separate WC. There is a one-car garage. The lot has an unusually large front garden, so there would be room for a "crescent shaped" driveway", excellent parking for two or more cars, offering safe access to the street. The house has a charming bucolic garden. A brick engineered high bank stream with bridge, runs through a garden that is not overlooked. The garden brims with wildlife. There is also a quaint potting shed. At the end of Lower Camden is small "village" of useful shops, a pharmacy, Post Office, Indian Restaurant, Fish and Chip shop, drycleaners etc., and a lively historic pub with a charming year round garden. A taxi service and well known "Seafood Restaurant" at Chislehurst station makes coming home, means, coming home! The house is in need of modernization. There is potential to extend the property subject to the usual planning consent. Viewing is essential to see this property's full potential. The space, and position of the lot, price to the right buyer with imagination to see its potential, makes this a unique opportunity.